Sometimes when things just aren't going all that well, it gets worse. Thankfully a fire was not involved in this latest bit of unfortunate news. First reported by San Francisco station KPIX, a failure in some heavy equipment at Tesla's Fremont factory that build the Model S has injured at least 3 workers early on Wednesday. The Fremont Fire Department was called to the scene at 11:52 AM (pacific). Update 1: Incident is burn related, as persons have been taken to Valley Medical Center burn unit. Brian Dinsmore, who is the news assignment manager first took to twitter to announce the incident, as well as posted a shot of emergency response crews currently on the scene. 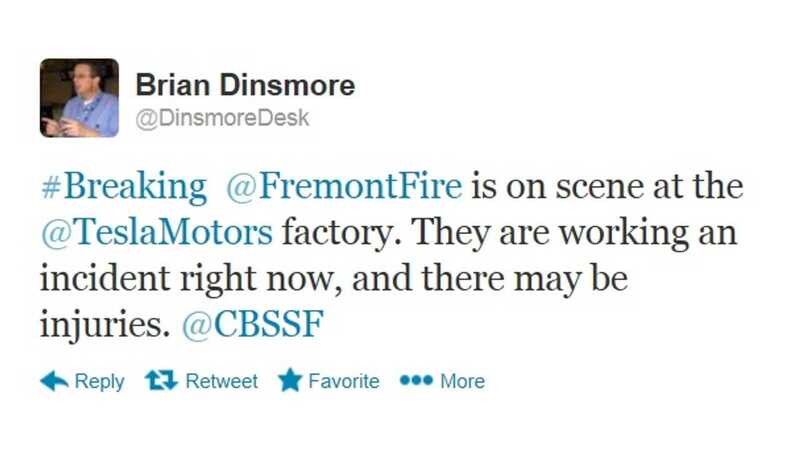 Mr. Dinsmore notes that "Fire trucks, ambulance at Tesla factory in Fremont" and that "...they are working an incident right now, and there may be injuries." Update 2: Two persons confirmed injured after an "incident" at the Tesla factory - both taken to burn unit at Valley Medical Center. Update 3: Three persons now confirmed injured. No details on exactly what occurred other than it was obviously burn related, but emergency crews are now leaving the scene. 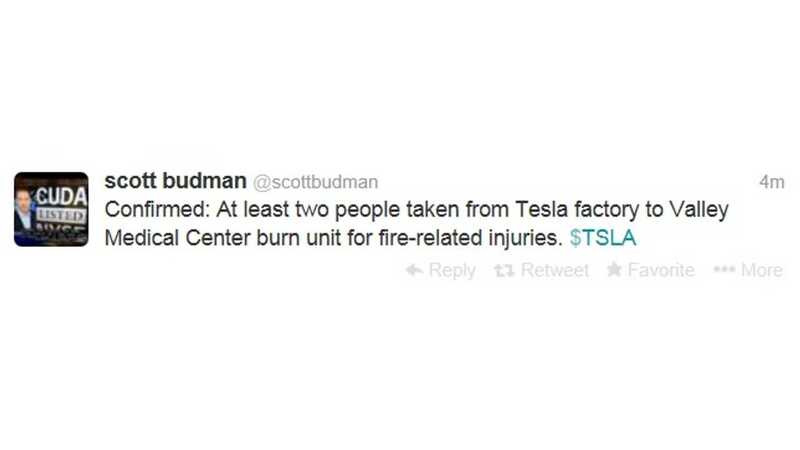 Update 4: NBCBayArea reports that no fire was present at the factory but incident "involved pressurized equipment." 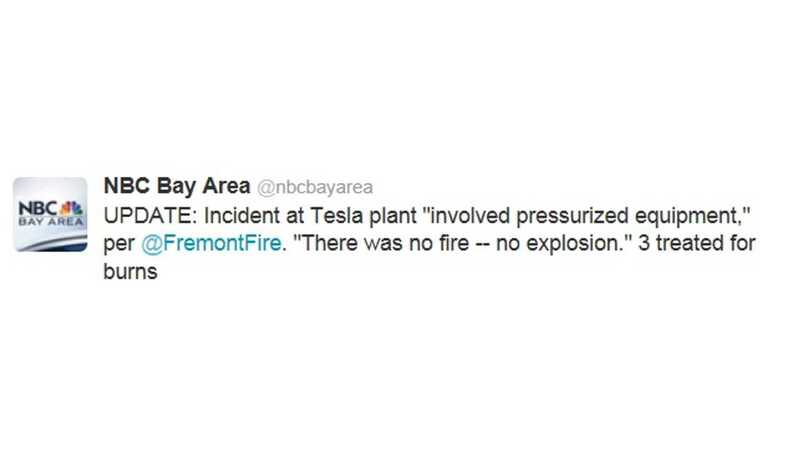 Update 5: Fremont Fire Department spokesperson Dan Cardenas said in a statement: “It involved pressurized equipment that they use at the plant...There was no fire, no explosion"
Update 7: Tesla CEO made a statement to the San Jose Mercury news about the accident, now officially classed as a "industrial accident"
"Two (workers' injuries) sound relatively minor, one more serious. (I) am going to visit them in the hospital later today and will personally ensure that they receive the best possible care." Update 8 (late afternoon): One worker released from burn unit. Two other still in hospital according to the hospital. 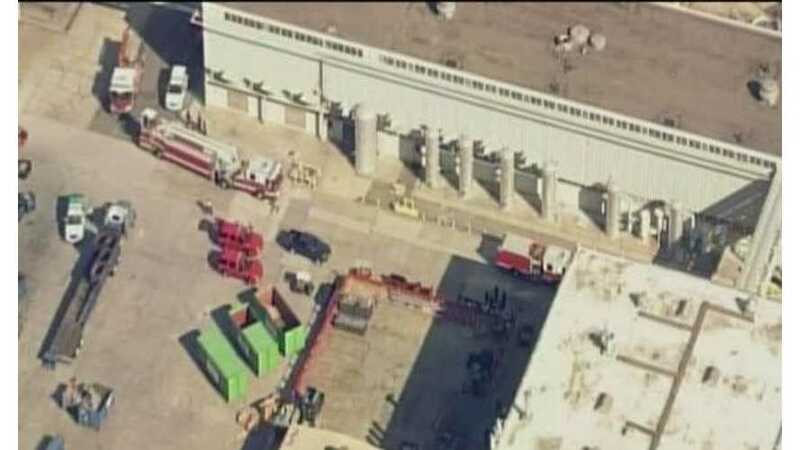 Update 9 (late afternoon): Most serious injury was to an employee who suffered burns to the chest and upper body according to Cal-OSHA spokesman Greg Siggins to NBC Bay Area. Update 10: According to San Jose Mercury News, Elon Musk visited the hospital around 7 pm and said that of the two remaining,"Kevin" will likely make a full recovery but the other had more serious injuries. "In the case of Jesus, his hands were burned pretty badly so it's not clear what the recovery is going to be," he said according to the Mercury News, "We want to have that recovery as much as possible and we'll do everything we can on that part."  This story will continued to be updated as more information becomes available. Our well wishes to the workers and their families.